Notice this locomotive is labelled "James Callanan"
Des Moines & Minnesota No. 3, an ungainly Danforth 2-6-0 of 1875, bore the name of the railroad's president, James Callanan. 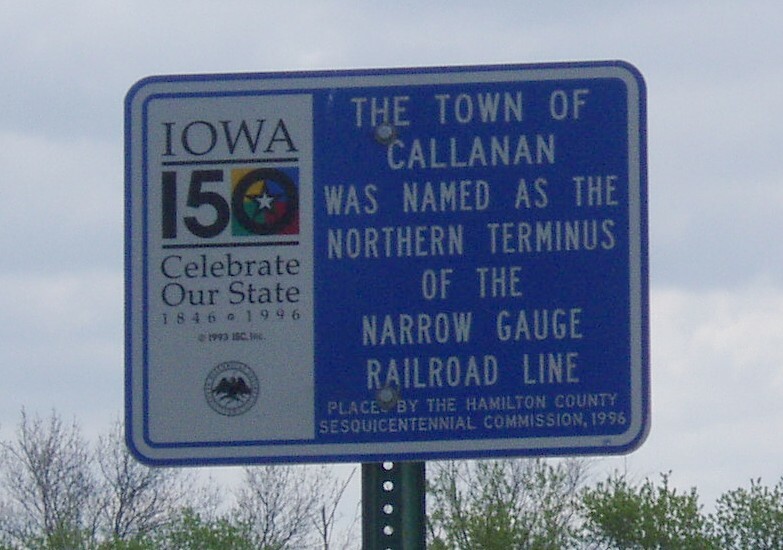 Not of a self-effacing nature, Callanan also named the line's northern terminus for himself. In addition to his business interests, Callanan was interested in education. He was a liberal giver to The Home for the Aged, Penn College in Oskaloosa, and was president of the Iowa Humane Society. He donated land to Mercy Hospital which was later sold to the Des Moines Schools. Callanan Junior High was named for him. It is now called Callanan Middle School. He also founded a normal College, then Callanan Normal College. After a fire destroyed part of the building, the college was moved to Drake University, to which he was also a donor. Eventually, Callanan Normal College became the College of Education of Drake. James Callanan also was important for his donations for the start of Iowa Methodist Hospital. Mr. Callanan died in Des Moines in 1904. Read news articles about James Callanan, the man whose name was used for the first platted town in southeast Hamilton County. In early 1878, the four townships in the southeast part of Hamilton County, Lyon, Lincoln, Ellsworth and Scott, voted themselves a 5% tax to induce a railroad to come to their area. The stipulation they made was that any railroad must pass within a mile of the intersection of the four townships. 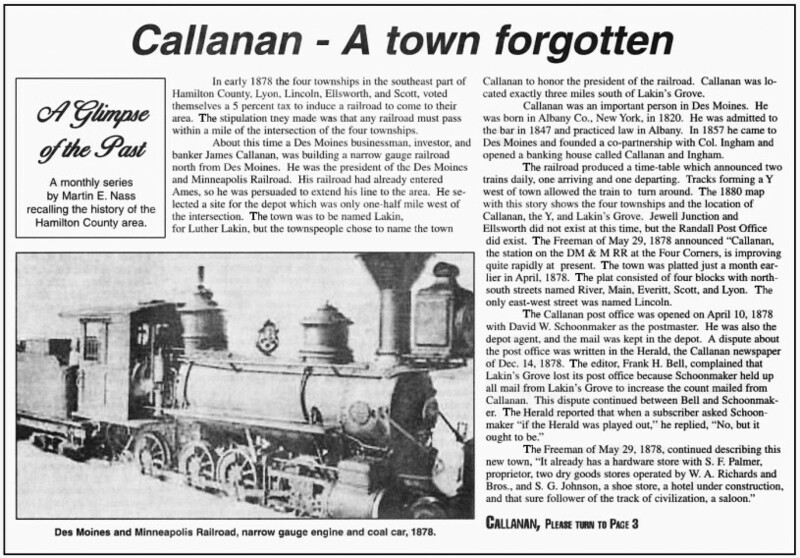 About this time, a Des Moines businessman, investor, and banker James Callanan, was building a narrow gauge railroad north from Des Moines. He was the president of the Des Moines and Minneapolis Railroad. HIs railroad had already entered Ames, so he was persuaded to extend his line to the area. He selected a site for the depot which was only one-half mile west of the intersection. The town was to be named Lakin, for Luther Lakin, but the townspeople chose to name the town Callanan to honor the president of the railroad. Callaqnan was located exactly three miles south of Lakin's Grove. Callanan was an important person in Des Moines. He was born in Albany Co., New York, in 1820. He was admitted to the bar in 1847 and practiced law in Albany. In 1857 he came to Des Moines and founded a co-partnership with Col. Ingham and opened a banking house called Callanan and Ingham. The railroad produced a time-table which announced two trains daily, one arriving and one departing. Tracks forming a Y west of town (atop the hill on the west side of the Skunk River) allowed the train to turn around. The 1880 map with shows the four townships and the location of Callanan, the Y, and Lakins' Grove. Jewell Junction and Ellsworth did not exist at this time, but the Ranall Post Office did exist. The "Freeman" of May 29, 1878 announced Callanan, the station on the DM & M RR at the Four Corners, is improving quite rapidly at present. The town had been platted just a month earlier in April, 1878. The plat consisted of four blocks with north-south streets named River, Main, Everitt, Scott, and Lyon. The only east-west street was named Lincoln. The Callanan post office was opened on April 10, 1878 with David W. Schoonmaker as the postmaster. He was also the depot agent, and the mail was kept in the depot. A dispute about the post office was written in the "Herald", the Callanan newspaper of Dec. 14, 1878. The editor, Frank H. Bell, complained that Lakin's Grove lost its post office because Schoonmaker held up all mail from Lakin's Grove to increase the count mailed from Callanan. This dispute continued between Bell and Schoonmaker. The Herald reported that when a subscriber asked Schoonmaker if the Herald was played out. He replied, "No, but it ought to be." The "Freeman" of May 29, 1878, continued describing this new town, "It already has a hardware store with S. J Palmer, proprietor, two dry goods stores operated by W. A. Richards and Bros., and S. G. Johnson, a shoe store, a hotel under construction, and that sure follower of the track of civilization, a saloon." If you cannot read this sign, click on the image to see a clearer version. It also reported that 16 carloads of grain and stock were shipped from Callanan, and five carloads of merchansdise were shipped in during one week. The trains came north on the west side of the Skunk River, then crossed the river, and ran up a slope to the town. Sometimes the engineer did not have enough speed, and the loaded train could not make the grade. Then the engineer backed down a long way and made another run at higher speed. At its highest point, Callanan numbered about 200 people. The business register showed two surgeons, several contractors, a hotel, a boarding house, three painters, a hardware store, a drug store, two dry goods stores, a pool hall, a barber shop, a brickyard, a blacksmith shop, a carriage and wagon shop, and a meat market. Charles Lakin was the town barber. He ran the pool hall in the same location and also sold coal, hair, lime, and farm machinery. On June 26, 1878, "Freeman" reported on the planned celebration of a "Regular Seventy-Six time in this little city of the 4th of July." The "Freeman" turned out the flyers which announced "the program of the occasion - wich will be made up of cannon firing at daybreak, orations by speakers from abroad, balloon ascension at 3 in the afternoon, and a display of fire works in the evening. A Des Moines brass band will furnish the music. A basket dinner, toasts, responese, ball playing, foot racing, callathumpian displays, concluding with dancing in the evening." This same paper announced that Callanan had erected fully a dozen buildings and has cellars and foundations laid for a hotel and three more residences. The article ended with the editor stating, "Callanan will be one of the most important little towns in the county." 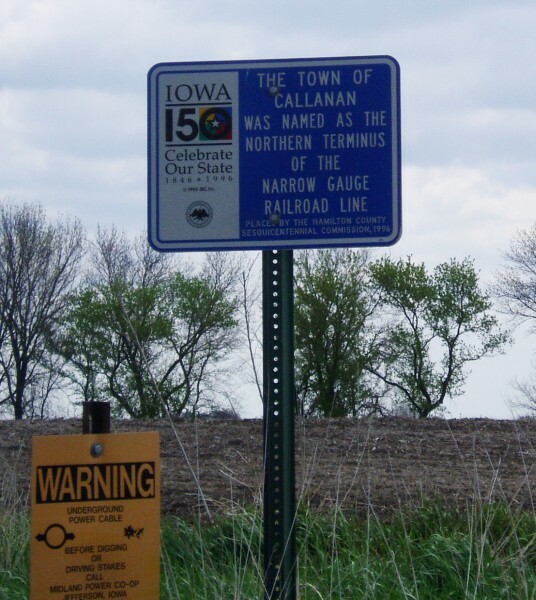 The little narrow gauge line was the means of bringing many excursion parties from Ames and Des Moines for a weekend of parying and drinking in the beautiful wooded area. Every mention of the town gives an indication that liquor flowed freely at all times, and when some sober citizens expressed concern for the future of thier town, the residents were quickly told that this was good for business and the furure prosperity of the town. This atmosphere contributed to two murders being committed during the very short life of the town. 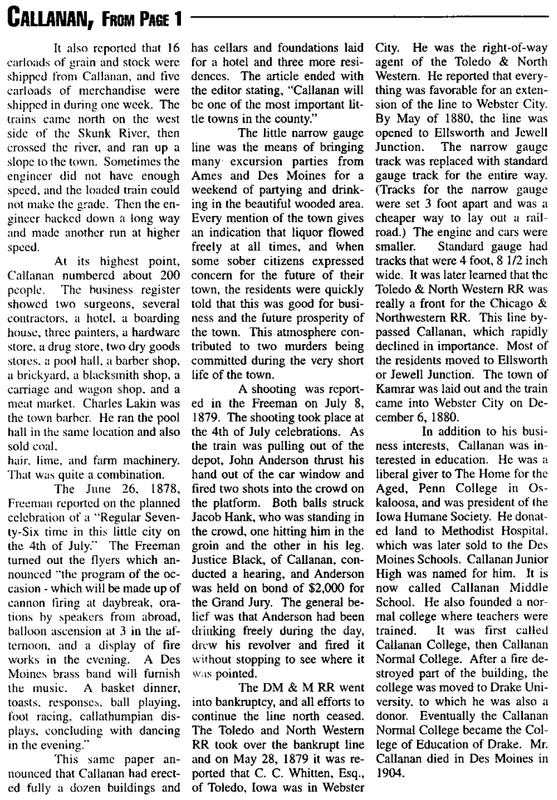 A shooting ws reported in the "Freemen" on July 8, 1879. The shooting took place at the 4th of July celebrations. As the train was pulling out of the depot, John Anderson thrust his hand out of the car window and fired two shots into the crowd on the platform. Both balls struck Jacob Hank, who was standing in the crowd, one hitting him in the groin and the other in his leg. Justice Black, of Callanan, conducted a hearing, and Anderson was held on bond of $2,000 for the Grand Jury. The general belief was that Anderson had been drinking freely during the day, drew his revolver and dired it without stopping to see where it was pointed. The Des Moines & Minneapolis Railroad when into bankruptcy, and all effors to continue the line north ceased. The Toledo and North Western RR took over the bankrupt line and on May 28, 1879 it was reported that C. C. Whitten, Esq., of Toledo, Iowa was in Webster city. He was the right-of-way agent of the Toledo & North Western. He reported that everything was favorable for an extension of the line to Webster City. By May of 1880, the line was opened to Ellsworth and Jewell Junction. The narrow gauge track was repoaced with standard gauge track for the entire way. (Tracks for the narrow gauge were set 3 foot apart and was a cheaper way to lay out a railroad.) The engine and cars were smaller. Standard gauge had tracks that were 4 foot, 8 and one-half inches wide. It was later learned that the Toledo & North Western RR was really a front for the Chicago & Northwestern Railroad. This line bypassed Callanan, which rapidly declined in importance. Most of the residents moved to Ellsworth or Jewell Junction. The town of Kamrar was laid out and the train came into Webster City of December 6, 1880. In addition to his business interests, Callanan was interested in education. He was a liberal giver to The Home for the Aged, Penn College in Oskaloosa, and was president of the Iowa Humane Society. He donated land to Methodist Hospital, which was later sold to the Des Moines Schools. Callanan Junior High was named for him. It is now called Callanan Middle School. He also founded a normal college where teachers were trained. It was first called Callanan College, then Callanan Normal College. After a fire detroyed part of the building, the collge was moved to Drake University, to which he was also a donor. Eventually, the Callanan Normal College became the College of Education of Drake. 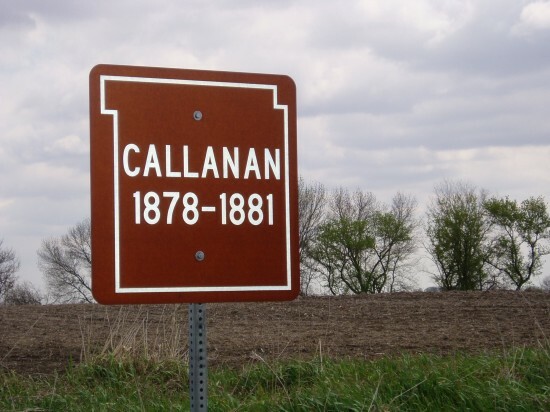 Mr. Callanan died in Des Moines in 1904. The settlement of Callanan was located near today's intersection of Tollman Avenue and 340th Street. Today, two signs mark that corner where Callanan once existed. Directly North across the 340th is where North Callanan would have been. 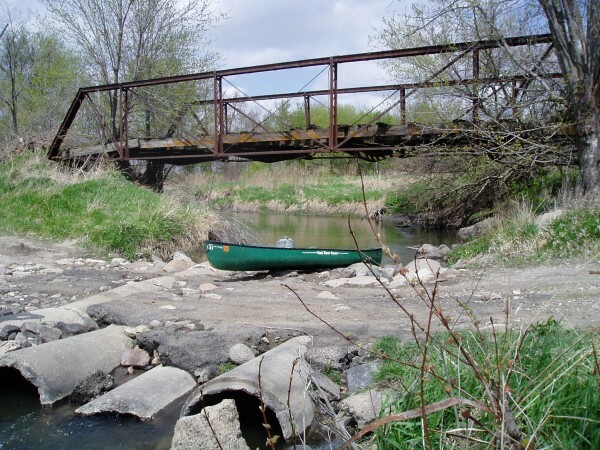 Today, the Skunk River in the Callanan area has a bridge across the Skunk River. However, this Skunk River bridge was not the railroad bridge crossing the river so that trains could go up the hill, cross Tollman Avenue, and be at the Callanan depot. The grade up the hill was steep enough that as the train crossed the river to approach Callanan, the engineer needed to head around the turn and go up the hill at full throttle. If the attempt was not successful, the train wuld have to back down and make another run. 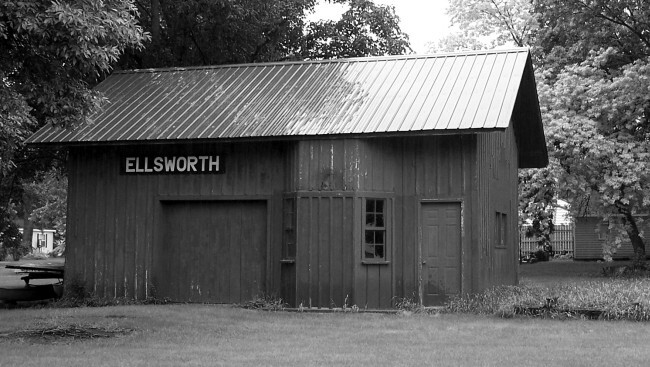 The Ellsworth depot is not the only surviving relic of Callanan. Read the next page to find why more Callanan materials still survive today.